Due to my wife working nights I was pretty much kicked out of the house with the kids so that she could get some sleep during the day. I don’t mind as I love spending the time with my kids, but they can certainly be a handful at times. They are both at their own stages of development which makes days-out a little harder. Thankfully our eldest has pretty much got over the potty training problems (although we still carry a portable potty for those times where she can’t wait), but our youngest is 6 months old and has started weaning. This is a good thing is some ways in that it means we can feed him at pretty much the same time as we have lunch, but our baby warmer isn’t enough to heat both the bottle and the food so we’ve been trying to eat at cafes. After the cost of food on this day-out, next time I’m going to try a picnic with an extra flask. I’ll get it right when the kids no longer need food warming – I had problems last time I tried to go on a steam train and wanted a bottle warming – Howarth and Keighley and Worth Valley Railway, with a baby. This time it was actually much better, just very expensive – but more about that later. Based on my past experiences and the problems of carrying a pushchair on a train I was going to avoid a train ride, but I did give Amelia the choice and the booklet I gave her, “Attractions in Worcestershire”, listed two different steam trains complete with pictures that caught her attention. 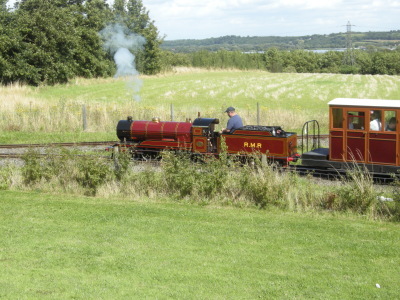 I decided to go with the Evesham Vale Light Railway as being a narrow gauge railway it usually means a shorter ride with less to explore and so you can get away without taking the pushchair on the train. As you can probably imagine holding onto a child’s hand, and carrying a baby and pushchair, at the same time, can be a bit of a challenge. This aspect paid off as we managed without a pushchair for the time we went on the train. Evesham Vale Light Railway is a small railway in Evesham country park. A full round-trip ride takes about half an hour. The second station is actually only about 5 minutes walk away, but the track goes a bit further including a short tunnel. We got off at the far station and waited for the next train, which was about 20 minutes wait. There were some picnic benches, but only a small shelter on the station to hide from the elements, in our case from the sun. We managed by using the picnic benches, but I sat with my back to the sun to block the hot sun from our baby. The railway charges for children from the age of two (which is a bit young) the cost is very reasonable at £2 for an adult and £1.40 for children. The staff on the railway were friendly, including one of the guards who said not to worry about not being able to find my ticket as I’d realized it was in my back pocket and I had our baby on my knee. I did hand-over the ticket to have it clipped when we got off the train, although we were not asked to. Afterwards we had a walk to the second station which was only about 5 minutes away and took no longer to walk than the train did. It was fairly hard-going with the double pushchair, but no worse than going anywhere else over grass. Before we went on the train we went to eat at the Apple Barn restaurant, located in the garden centre. The food was good, but the children’s food was very expensive. First up the baby food for a 6-month old cost £2.45. I also couldn’t find the bibs in our change bag (new style bag, but I later found some in a hidden pocket inside), so I asked for one. Normally these would be provided free (including in most cases even if you didn’t buy their food), but in this case they charged me 85p for a bib and two baby wipes. What a rip off! Especially as they should have been only 75p and included 3 more baby wipes. With 11% extra charged at the till, I now wonder if they overcharge on other items as well? A total cost of £3.30 for a meal for a 6-month old baby. I also thought the child meal was quite expensive for a sandwich lunch-box at £3.95 – especially as I only paid 60p extra for a light adult meal and drink. The restaurant did include a small children’s play area consisting of a few toys and pictures to colour. Rather than pay the ice cream prices as the restaurant’s ice cream parlour we bought ice creams from the Millets farm shop. They had good quality ice cream at a reasonable cost, starting from 99p for a small tub or 99p for a pure fruit juice lollipop (very nice!). There are no toilets in the actual restaurant, but there were some in the main part of the garden centre which included baby changing. There are also toilets outside the Millets farm shop, with baby changing in the disabled. There is also an Ark Animal Sanctuary, but we did not visit that and there was no indication what the cost is from outside. There are also a few other shops including a Works bookshop and a couple of clothes shops. It’s well worth a visit to the Evesham Vale Light Railway, and not too difficult with young children, but I’d definitely avoid the Apple Barn restaurant if you want good value for money. You could try the cafe inside the Ark animal sanctuary (accessible without paying to go around the rest of the sanctuary), or taking your own picnic to have near the far station. See more days-out with babies and children. This entry was posted on Monday, August 18th, 2008 and is filed under Babies, Children, General, Midlands, Redditch Worcestershire, Tourism. You can follow any responses to this entry through the RSS 2.0 feed. Both comments and pings are currently closed.